The hit cable television show Dirty Jobs, where host Mike Rowe and his crew are “shown performing difficult, strange, and/or messy occupational duties alongside the typical employees” was in the Yakima Valley last week shooting an episode during the hop harvest. According to the Yakima Herald-Republic, “Rowe spent two days picking and inspecting hops, working the kilns that dry the hops and making bales, [HopUnion owner Ralph] Olson said. In addition to visiting HopUnion, which provides hop leaves, pellets, extracts and oils to the craft brewery industry, Rowe worked in the fields at Loftus Ranches in Moxee.” The episode is expected to ait sometime this winter, though no date has been set. 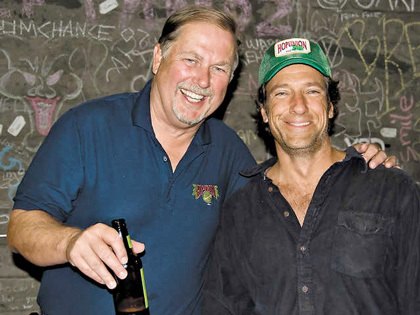 HopUnion’s Ralph Olson with Dirty Jobs’ host Mike Rowe. Now that’s a dirty job I bet Mike enjoyed. Plus it looks like he got to sample some brews afterwards. This is one dirty job he’ll be back for more next year! I’ll look forward to watching that episode. wow i really wish that smellovision was up and workin for that episode. oh how i love the smell of hops. I bet Ralph O and Ralph W had a great time with him! HopUnion folks are the best! Is it just me or does Mike already look like he put back a few. Cant wait for this one. DVR-ing every episode until i get to see this one.